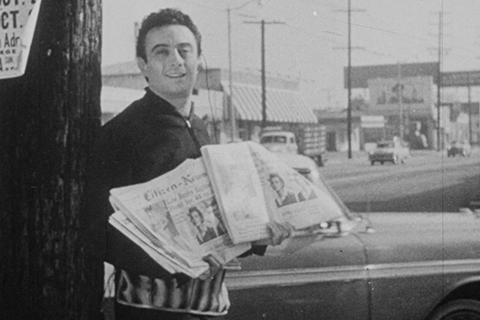 The Brandeis Library is very pleased to announce the acquisition of an original, unreleased short film featuring comedian Lenny Bruce. The untitled 12-and-a-half minute 16mm film is a darkly comic, silent account of a down-on-his-luck street newspaper salesman, played by Bruce. The film follows the ups-and-downs — mainly downs — of the main character, from his dreams of owning a motorcycle jacket, to his clashes with the landlady of the flophouse in which he resides (probably played by Bruce’s mother, Sally Marr), and an accidental, fateful run-in with a drug dealer and police. The film is a significant addition to Special Collections existing, extensive Lenny Bruce collection. Based on William Karl Thomas’s descriptions in his book Lenny Bruce: The Making of a Prophet, it bears a striking resemblance to another short film by Bruce called the Leather Jacket. However, the film at Brandeis is believed to be a collaboration between Lenny Bruce and “Count” Lewis DePasquale, a friend of the comedian, who likely contributed the film’s jazz soundtrack. Prior to its acquisition, the film had been held by the DePasquale family, following Count Lewis’s death in 2001. As a close friend of Bruce, DePasquale chronicled much of the comedian’s early 1960s heydey, when the film was likely produced. This work will now be available for the first time through the Library’s University Archives & Special Collections Department. This exciting acquisition was made possible through the support of Ann and Abe Effron Fund — Donor Advised of the Community Foundations of the Hudson Valley. For more information about the film, please contact the University Archives & Special Collections Department at ascdepartment@brandeis.edu.